Lewis and Clark. Holmes and Watson. Mac and cheese. These, some of mankind’s greatest partnerships and collaborations, prove that when you pair up two great things, you can create one super entity that’s new and completely original. In the spirit of Jameson Caskmates, a truly unique Irish whiskey born from a collaboration with a craft beer brewer, let’s review a few standout collaborations in our history. When you’re about to mix a drink, your goal is probably to deliver it to your mouth in the easiest way possible. The swizzle stick/bar spoon allows for maximum efficiency by combining two of the most useful bartending implements. Originating in the Caribbean, the swizzle stick contains ridges to help you roll it quickly between your palms. This allows you to stir and blend your drinks, while the prongs at the end allow you to spear fruit or olives. The bar spoon at the other end can be used for additional mixing and layering for cocktails. Thanks to this handy combo, you have one less utensil crowding your kitchen drawers, and one less to wash when you should be enjoying your rum punch in peace. Anyone who was a middle schooler in the 90s probably covets a pair of these to this day. For the uninitiated, these are sneakers with wheels embedded into their soles. That means they functions as both regular shoes and a sick pair of skates. These were practically a requirement if you wanted to impress your lockermate in middle school. Running late? 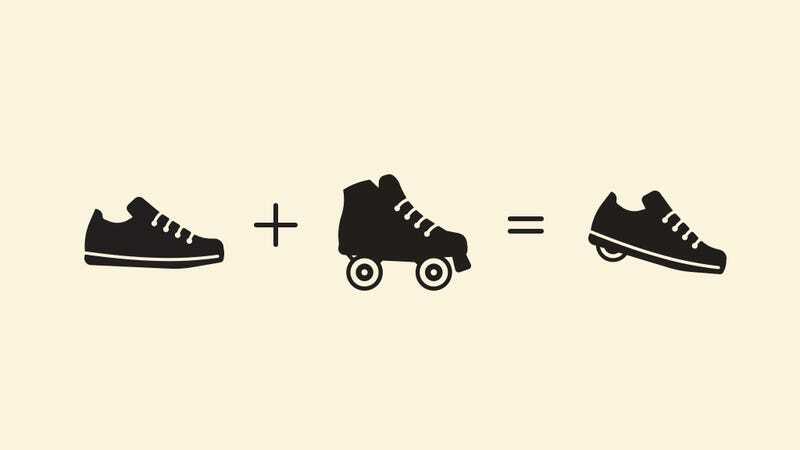 Just switch easily from sneaker to skate and roll your way to punctuality. Unfortunately for skate-enthusiasts of today, they have been banned in some malls. This sport pairs flying discs and golf, but unlike its preppier older brother, golf, the sport is played without balls and clubs. Instead, players throw the disc into a target. As with regular golf, the terrain can change to increase difficulty. Though it isn’t played as much for business meetings with clients and impressing your father-in-law, it nonetheless enjoys a fair amount of popularity: the Professional Disc Golf Association has more than 50,000 members. While campers tend not to prioritize comfort, a bad night’s sleep can hamper anyone’s time with Mother Nature. Relegating yourself to the cold, hard ground may leave you with an aching back come morning, which throws a wrench in all your grand hiking plans. A hammock solves that problem, but leaves you open to the elements. Save yourself from becoming soggy and cranky with the tent hammock. It hangs like a hammock and covers you like a tent, so you can sleep through the night and wake up ready to hike, fish, and eat charred-to-perfection meats. Jameson’s new one-of-a-kind offering, Jameson Caskmates is a match made in bar heaven. It all began when Jameson’s Master Distiller met the Master Brewer of Franciscan Well Brewery for a drink. The two hatched a plan to send some casks that had previously held Jameson Irish Whiskey to the brewery to age some craft Irish stout. When the casks eventually returned home, the Master Distiller filled the stout-seasoned barrels with Jameson whiskey, and Caskmates was born. With hints of hops, cocoa, and coffee and a scent that includes apple, pear, lime zest, and spice, Caskmates holds true to its stout influence, while retaining the superb taste of Jameson. Its smooth finish, with touches of chocolate and butterscotch, is wholly original. Like the other collaborations, it proves that when two very different things come together, they can create something revolutionary. Grab a bottle and find out what the partnership is all about. JAMESON® Irish Whiskey. 40% Alc./Vol. (80 Proof). Product of Ireland. ©2015 Imported by John Jameson Import Company, Purchase, NY. Taste responsibly. This post is a sponsored collaboration between Jameson Caskmates and Studio@Gawker.